"Eight-week-old Swissy Saint puppies—these are a cross of the AKC Greater Swiss Mountain Dog and AKC Saint Bernard. They are very laid-back and gentle family pets. They mature to 110 to 140 pounds. The Swissy Saint is a dry-mouth dog that may have medium or short hair. 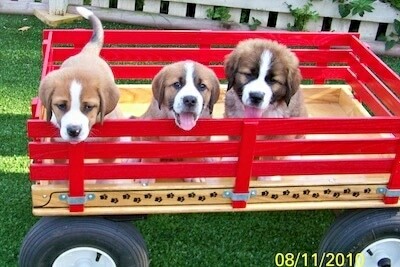 They have the white markings of the Swissy and the mahogany coat color of the Saint. Some will have a black mask. The Swissy Saint requires at least a half-hour daily walk, weekly brushing, and loves to spend time with their family. Photo is courtesy of Mountain Dog Manor." The Swissy Saint is not a purebred dog. It is a cross between the Saint Bernard and the Greater Swiss Mountain Dog. The best way to determine the temperament of a mixed breed is to look up all breeds in the cross and know you can get any combination of any of the characteristics found in either breed. Not all of these designer hybrid dogs being bred are 50% purebred to 50% purebred. It is very common for breeders to breed multi-generation crosses.